Oh Man. . . We’re Excited About This! . . . .
One of our goals here at CPYU is to help parents, youth workers, and teachers effectively teach kids how to integrate their faith into all of life. One of the most discouraging marks of churched and professing Christian kids today is that they are living very disjointed lives. While they might be applying their faith effectively and consciously to one or more areas of their lives, they fail to see how their faith should inform other areas of their lives. Perhaps you’ve been frustrated by the growing number of kids who never endeavor to think consciously and Christianly about what God and His Word might have to say about the hours and hours of media that they engage with each and every day. Our duty and calling is clear – we must teach kids how to integrate their faith into their media use and choices. To that end, several years ago I wrote a little media evaluation guide that’s been taught and used with tens of thousands of kids. 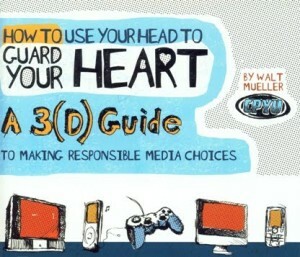 It’s called, How to Use Your Head to Guard Your Heart: A 3(d) Guide to Making Responsible Media Choices. Kids are using this guide to filter everything they see, hear, and use in their media world. Now, we’re really excited to tell you about another media evaluation tool we’ve developed in conjunction with Doug Fields and our good friends at Simply Youth Ministry. The folks over at SYM are known for developing cutting edge DVD curriculum for use with kids. 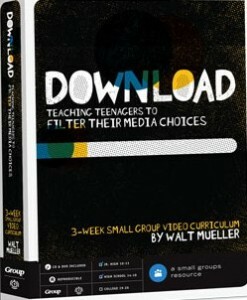 I was thrilled when they came to me and asked, “How would you like to do a DVD curriculum with us that youth workers, parents, and teachers can use to help teach kids how to use your 3(d) guide?” Easy answer. . . . “SURE!” So, we put together Download: Teaching Teenagers to Filter Their Media Choices with Walt Mueller, a 3-part video curriculum that you can learn more about here. As the fall kicks-off and you’re looking for something substantial to use as a teaching tool with your kids, please consider using Download. This isn’t a once-and-done proposition. Once you’ve gone through the 3 lessons with your students, spend one meeting or small-group time every month practicing the skills and engaging in real-life Bible study. ← The Big Problem With Marriage. . . . I am super excited about this! I’m talking to my administration ASAP about getting this for my classes. Praying for you in these tough days. Thanks for your witness to the Lord’s great mercy and love even through the trials.